Stringent industrial requirements for sophisticated performance and circumstantial control of microdevices or nanotechnology manufacturing, and other types of machinery at multiple scales, require complex materials. The adjective ‘complex’ indicates that the substructure influences gross mechanical behaviour in a prominent way and interactions due to substructural changes are represented directly. Examples are liquid crystals, quasi-periodic alloys, polymeric bodies, spin glasses, magnetostrictive materials and ferroelectrics, suspensions, in particular liquids with gas bubbles, polarizable fluids, etc. 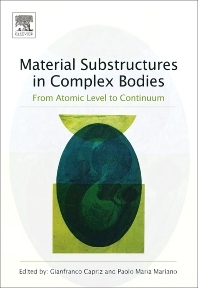 The mechanical behaviour of complex bodies described in this book gives rise to a wide variety of challenging problems from the macroscopic- to the nano-world. The chapters composing this book explore various aspects of these problems, giving rise to new areas of discussion together with specific solutions. Contributors are Carlo Cercignani, Gianfranco Capriz, Pierre Degond, Antonio Fasano, Harley T. Johnson, Sukky Jun, Krishna Kannan, Wing Kam Liu, Alberto Mancini, Paolo Maria Mariano, Ingo Müller, Kumbakonan R. Rajagopal, Jan Jerzy Slawianowski. Material Substructures in Complex Bodies will be a useful tool for researchers and students working on the basic mathematical and physical problems accruing from the mechanics of materials. Prof. G. Capriz has founded in the 1980’s the primary abstract format of the mechanics of complex bodies, generating a school about this subject. As a fellow of the “Accademia dei Lincei”, he has pushed strongly the work in mathematical physics in Italy indicating profound and innovative directions of research. Prof. P. M. Mariano has developed in the last ten years the general structure of the abstract model-building framework of the mechanics of complex bodies substantially, unifying existing models of complex matter and suggesting new ones. His wide research work range from solid to fluid and is essentially theoretical.